It’s been cold all over. I live in South Texas and we are feeling the freeze here too. I know it’s not as cold as other part are but we are not used to degrees in the 37 range so we are COLD! This got me thinking about passion. Dictionary.com describes passion as being an intense emotional feeling for an object or thing. It also talks about passion of the other sorts but I want to stick with the first description. Passion to me is a driving force inside oneself that pushes that person towards or for something he/she cares deeply about. I have been fortunate enough to have always had jobs that I could feel passionate about. I know it may not be so for others but for me, it has kept me going. I feel lucky in that respect. A little over a year ago, I was not really living my passion, I went on a long hiatus and was not creating art, I was not seeking out really anything. I was not very happy either. I still remember when it occurred to me that I needed to get back into this art journey I have been back on for a few months. It was like this nagging itch that I could not reach, you know the kind, it’s right there somewhere on your back or you wiggle and worm your way trying to reach it but it can keep you moving like a nut until that itch is scratched. Nothing else in my life has changed much. The only thing that has changed is I feel more energetic and alive than I did about a year ago. We all have something in life that we care deeply about or have strong feelings for. For me it is art and creating art. I still remember back in 2008 when I took my first stab at drawing. I really didn’t even know I could draw. I thought the best I could do was draw stick figures, but even the stick figures I used to draw in 2005 were very illustrative of emotion and so I had a feeling I had it in me. So there I was, buying pencils and charcoal and I didn’t even know how to use things like the blending tool. But I learned and before I knew it, I was not content UNLESS I had four or five drawing done by the end of the day. You see, when you are passionate about something, you do it regardless. Like that man jogging in the cold. He could have pulled the covers up over his head and said, “Too cold today, I’ll try again tomorrow”. But he didn’t. Just a couple of days ago, I took off to the bayfront near the ocean to try and shoot some pictures. I had my daughter with me, her friend and my dog. It was not long before my dog wanted to get home, the kids were having fun even in the cold but after a while, as I was holding my camera, I could feel my fingers go numb, like I could not open my hand andclose them quickly. I knew it was time to go but while I was shooting pictures I didn’t even notice this happening to my hand. A friend of mine told me once he walked up the Harbor Bridge JUST to get this one night shot of the city. If these don’t show you what passion is, I don’t know what else will. Does this mean that living your passion is easy? No, it does not. It does require work, time, energy but if it is something you love, it won’t seem like work. I have found that since I started back up on this art journey, I get up earlier in the morning, I go to bed later yet I feel more rested when I do get some sleep. Passion for something is a feeling you just can’t ignore. Like that itch I was talking about earlier. Nothing will ease you, satisfy you or give you that “Aahhh” feeling until it is scratched. If you know the answer to this question, are you doing something with it? If not, we are in a brand new year and this could be your year to live your passion! What are you waiting for? It’s an image that I created with my heart and soul. I wanted to find an interesting way to photograph the Harbor Bridge and here it is. 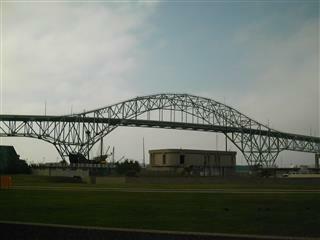 Here is a picture of the Harbor Bridge in it’s entirety. Here are some cool quotes about passion I would like to share with you. I learned this technique in a design class a few years ago. It’s simply lines. It serves as a wonderful practice exercise and also is very calming for me to do this type of art. It’s been a favorite way to draw or doodle while I am watching television. It is also very therapeutic for me when I have a lot going on in my personal life and it helps me think more clearly. When I start on a drawing like this, I start with a pencil. I make the initial lines as the skeleton of the piece. As I am adding the other lines between the spaces, more often than not, an image appears before me. I am usually not sure what will come out of it but something always does. I have experimented and planned on certain images I wanted to show up but the best pieces to me are the ones where I see the image later on. I like to draw like this as a way of stretching my creative muscles. An art teacher once said that usually images are not supposed to be apparent but somehow they most always do. Can you read between the lines of this art piece? Ever have one of those mornings where you feel just overwhelmed with the start of a new week but you feel like you haven’t even finished off last week? I know the feeling. As an Artist who works from home, I can tell you that it’s not a 9-5 type of job. Working from home whether you are an artist, writer or practically any job that gives you the freedom to work from home can be a challenge. Your workload doesn’t really have a quitting time, nor are you afforded the luxury of a day off. Your hours can start very early like 5 am and last on through the wee hours of the night. At least for me there are blogs to write, images to edit, art pieces to finish off, networking and more promoting of my work. Sometimes these efforts won’t see a result until some time has passed but I do it anyway. I know eventually there will be someone who sees my art and loves it enough to want it in their home. So I keep on keeping on. Here are 5 things I do to help me stay on top of the Monday Morning Rush and I thought I would share them with you. 1. Keep a daily log of tasks accomplished and a reminder of what I still need to do. Whatever it is, I jot it down on a small note pad that I call my “Daily Planner”. It’s a simple small notepad with lines and three columns. First column is rather narrow and is listed as Priority Ref: I just jot down A for Urgent, B for important and C for Reminder. Throughout the day as I am going about my business, I look at the list and tackle the urgent ones first. The second column is wider and allows enough space to write a few words of the task at hand. The last column is narrow like the first one and is listed as DONE, narrow enough for me to just put a check mark. And believe me, it feels great when I see all those check marks down my list. It gives me a sense of accomplishment. “DO is the First part of DONE” taken from the cover of my Daily Planner. 2. Tackle the things you have the least desire to do first. It would be just grand if I could spend my entire work days and hours just creating. It’s what I love to do. However in this day and age especially for creative people like me, I know that just isn’t feasible. I need to spend as much time promoting my work as I do in creating it. No one will toot my horn, so I know I have to do it. I will do the work that I least like to do early in the day so I can breathe and relax while doing the things I most want to do. 3. Break up projects into smaller tasks so as not to get overwhelmed. Just last week, I took over an art group on Fine Art America. It had approximately 100 members. My responsibilities include growing the group, reviewing images to be added to the group, holding contests for the group members to participate in and create discussions for members to participate in for networking, support and resource sharing. It’s proving to be a big job. Since last Thursday when I first took over this group, we had about 104 members. Since then it has grown to 188 members just this weekend. That means a lot of images to review and add to the group. So what I have decided to do is every time I go to Fine Art America to do some work, I check for the latest images to review. I would much rather spend a few minutes reviewing 10-15 new images several times a day than spend an hour or more reviewing say 80 or 90 images. 4. Streamline your work/promotion efforts. I have several ways in which I am trying to get my work out in front of people. Here is my list. This blog where I write about my art and other things. Google+ is not yet set up but is in my Daily Planner List as A-for Urgent to set up this week. These sites are where I can create links and combine my efforts to involve 2 or more of these vehicles, and I do that regularly. I also want to make sure that all my efforts to network and promote come directly from me, so I do spend a lot of time behind my laptop, but I know in the end it will be worth it. 5. Get to sleep EARLY on Sunday. This is very important as it really helped me this weekend. I make sure to get to get a good nights sleep on Sunday Night. I went to bed early last night and I can just feel the difference it has made for me in terms of alertness and feeling refreshed and ready to take on the rest of this week. 6. Know that Monday is your chance to start fresh. Okay, I was going to give you just 5 but I had to throw in one more. Realize that today is a NEW day. You can pick up where you left off and don’t beat yourself up for what you did not finish last week. It is now time to start up again and do the best you can. By doing the best you can, you can feel rest assured that you are on the right track. Until Next time and HAPPY MONDAY! There is a certain freedom you feel when you finally stretch open your arms and let go. It could be a relationship that you know is not letting you be the best you can be. It could be a past hurt or wound that simply refuses to heal. It could be a concern over your future and that nagging little voice telling you that the path you are on is going to go nowhere real fast. Whatever it is. Let it go. somehow hidden behind all your efforts in holding on. than what actually will happen. When you let go, you free yourself to feeling happy again, to dreaming again and there is room to grow in your head and your heart.